HIV-positive women are stigmatized, and discriminated against, because of their serological status. The stigmatization begins at home, and is often conveyed through piercing words and hurtful glances. Voahilikilika ireo vehivavy mitondra ny aretina VIH – ary iharan'ny fanavakavahana noho ny satany. Manomboka ao an-tokantrano izany fanilikilihana izany ary matetika miseho amin'ny teny manindrona sy fijery mandratra. Noho ny fanampian'ny fikambanana nahazo vatsy tamin'ny Rising Voices, nampiofana ireo tompon'andraikitry ny serasera eo amin'ireo fikambanana isan-karazany misahana ny SIDA ao Kongo amin'ny alalan'ny filazana tantara, fandraketam-peo sy fananganana bilaogy ny AZUR Development . Ny tanjona dia ny handraketan'ireo mpandray anjara ny fanilikilihana sy ny fanavakavahana ny olona mitondra sy nifindran'ny VIH sy SIDA ao Kongo ary mampiasa azy ireo ho fitaovam-piarovana. 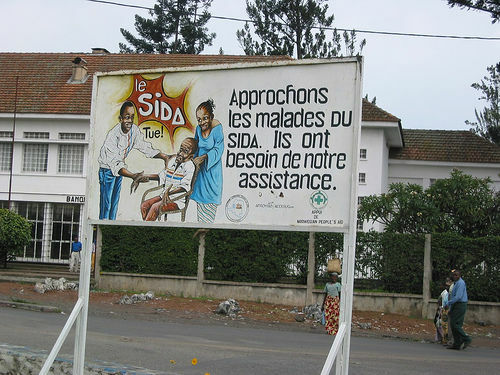 In the northern part of Congo, specifically Makoua (more than 600 km from Brazzaville), on-site management of HIV is done at the hospital and the Malieré center. The biological examinations aren’t done there, patients are referred to Owando. In this locality, there doesn’t exist any organisation fighting against Aids. Therefore, community measures for prevention and care are nonexistent. Any amin'ny faritra avaratr'i Kongo, indrindra ao Makoua (maherin'ny 600 km avy ao Brazzaville), misy ny toerana fitantanana ny SIDA atao ao amin'ny hopitaly sy ny foibe Malieré. Tsy misy ny fanadihadiana biolojika atao ao, alefa any Owando ireo marary. Tsy misy fikambanana miady amin'ny Sida ao amin'izany toerana izany. Noho izany, tsy misy ny fepetra ara-piarahamonina amin'ny fisorohana sy ny fitsaboana. People living with HIV/AIDS in the Congo continue to live with stigma and discrimination at their work places and within the hospitals of the Congo. Recently, AZUR Development, an NGO based in the Congo, with the support of the National Foundation for Democracy (NED), recognized this reality and organized meetings and workshops throughout the country on the rights and duties of people with HIV/AIDS. Mbola mizaka fanilikilihana sy fanavakavahana eo amin'ny toeram-piasany sy any amin'ny hopitaly any Congo ny olona mitondra VIH/SIDA any Congo. Vao haingana, ny AZUR Development, FTMF iray (ONG) miorina ao Congo, miaraka amin'ny fanohanan'ny National Foundation for Democracy (NED), no niaiky izany zava-misy izany ary nikarakara fivoriana sy atrikasa manerana ny firenena mikasika ny zo sy adidin'ny olona mitondra ny VIH / SIDA. The activities conducted in these missions included support groups to bring awareness of the law, meetings with healthcare workers, evaluations concerning the accessibility of treatments and information for people infected with HIV, and sharing on good practices. These activities were hosted in Congo by AZUR Development, and in Benin, by The Beninese Development Association (ABD). Ny asa natao tamin'izany iraka izany dia nahitana ireo vondrona fanohanana mba hanao fampahafantarana mikasika ny lalàna, fivoriana miaraka amin'ny mpiasan'ny fahasalamana, fanombanana mikasika ny fahazoana fitsaboana sy ny fampahalalana ny olona voan'ny VIH, ary fizarana fomba fanao tsara. Notontosain'ny AZUR Developement tao Congo, sy notontosain'ny Fikambanan'ny Fampandrosoana Benoà (ABD) tany Benin ireo hetsika ireo. Marien Nzikou-Massala mampahafantatra fa miasa mba hampihenana ny fanilikilihana sy fanavakavahana ny olona mitondra ny VIH/SIDA any amin'ny hopitaly sy ny toeram-piasana ireo FTMF (=ONG) ao RDC. Sylvie Niombo mandrakitra ny antsafa niarahana tamin'i Simon Moubolo, mpandrindra ny tetikasa VIH / SIDA ao amin'ny AZUR Development ao Brazzaville sy tamin'i Régine Goma, mpiara-mandrindra ny Biraom-paritra momba ny torohay sy ny fisorohana ny SIDA (ARIPS). Noraketin'ny tambajotra Afrikana misahana ny SIDA ny antsafa. Milaza i Simon sy i Regine hoe ahoana no ahafahan'ireo “Kongoley mpikatroka SIDA mizara ny traikefany amin'ny namany mba hampiroboroboana ny zon'olombelona”. Ny tranokalan'ny Azur “Vehivavy Kongoley ao amin'ny tranonkala” mamaritra [fr] ny fomba fanehoan-kevitry ny vehivavy Kongoley ao amin'ny aterineto mikasika ny fanoherana ny fanorisorenana ara-nofo.